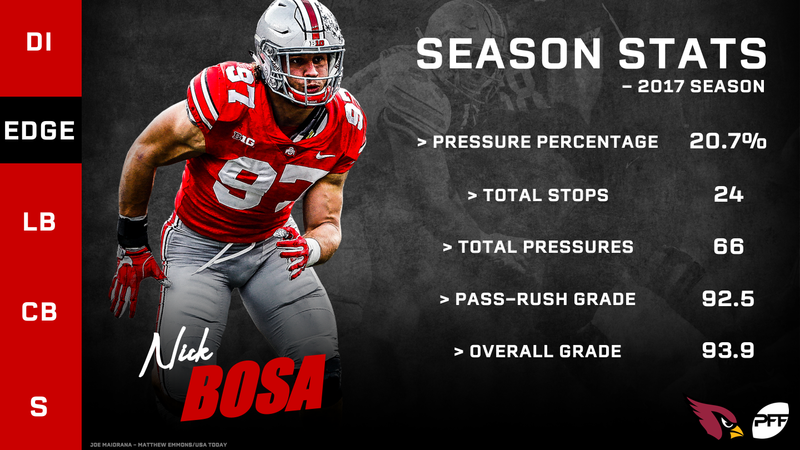 We’re back with PFF Mock Draft 3, the first offseason look at the NFL and NFL draft landscape. While we’re much later in the process than our previous September and October mock drafts, some of the new names from each of them lived up to the hype, while others dropped off and potentially out of the first round after their respective 2018 seasons. As usual, the draft order is in place to where each team has now officially been slated to select up to Pick 28, while the final four picks are an estimate based on final Super Bowl odds from our PFF Forecast team. This mock draft also takes into account all of the 2019 NFL Draft early declarations for underclassmen who had to officially declare their intentions for entering the draft as of Monday, January 14. Important to remember, this is a mock based on what I would do, not a prediction of what your favorite team will do. The best pass-rusher in the draft, Bosa adds an immediate complement to Chandler Jones up front after posting the nation’s highest overall grade among edge defenders in 2017. 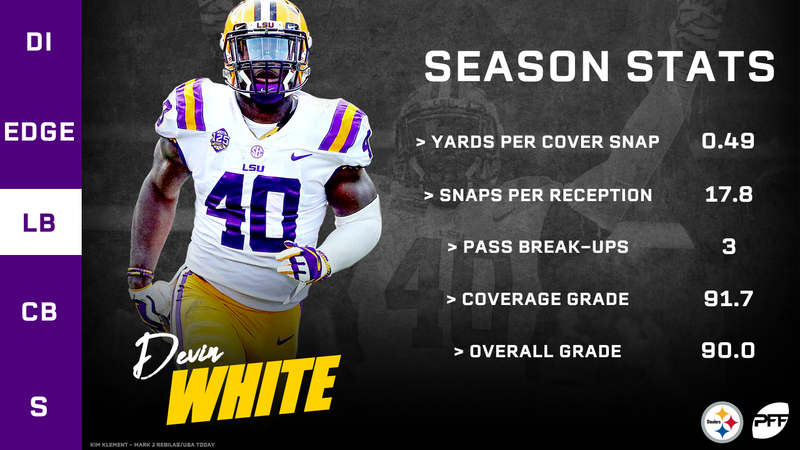 The best player in the nation in 2018, Williams emerged as a dominant interior presence that can disrupt both the pass and the run games. He had the nation’s No. 2 pass-rush grade to go with the No. 1 mark against the run, and he adds a difference-maker as the 49ers continue to develop their defensive front. The Jets have many different ways to turn but they go with the best offensive tackle in the draft in Williams. He allowed just 13 pressures on 482 attempts last season. Few players improved their draft stock as much as Allen this season and he becomes a key piece in Oakland’s defensive overhaul. His 92.1 overall grade led all edge defenders and he ranked 10th in the nation with 57 total pressures despite ranking just 160th with only 258 pass-rush attempts. 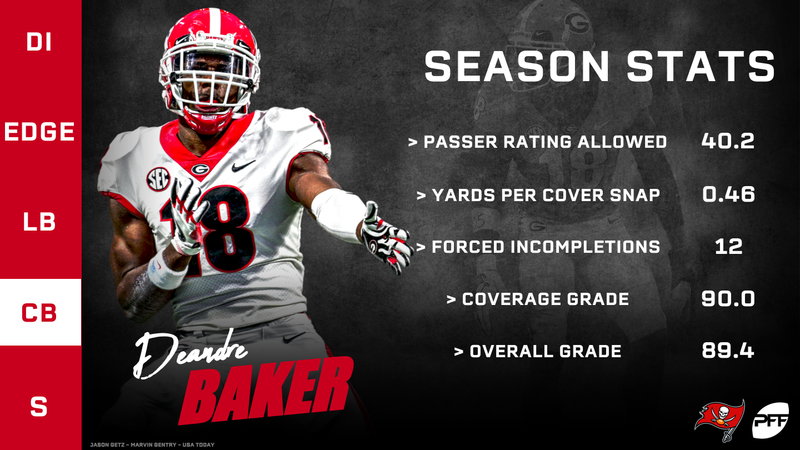 Baker is a fit for any defensive scheme and as he can play both man and zone coverage with excellent ball skills. He allowed a passer rating of only 40.2 into his coverage last season. OK, here’s where the draft gets interesting. The QB-needy teams are upon us, and there’s a good chance we see movement at the top of the draft come April. The Giants go with Murray who is looking to buck all trends about what an NFL QB looks like from a size perspective. He posted the top passing and rushing grade among quarterbacks in the FBS last season, and the Giants will look to his dynamic playmaking ability to turn around their quarterback position. Haskins is a much more traditional quarterback compared to Murray as he blends excellent accuracy with a solid arm when throwing from the pocket. He was outstanding when throwing from a clean pocket, as indicated by his 90.3 PFF grade and 134.8 passer rating, but there are concerns about how he’ll handle pressure as his grade dropped to only 58.7 and he saw pressure on only 24.1% of dropbacks, well below the NCAA average. The cornerback position opposite Darius Slay has been a multi-year issue in Detroit, and Williams plays the brand of man coverage that head coach Matt Patricia is looking for. He has the size and physicality to play press coverage and he allowed a completion percentage of 40.3% and a passer rating of 58.1 last season. The quarterback value just doesn’t match up yet for the Broncos at this point, but they add one of the best corners in the class in Murphy who allowed a passer rating of only 54.5 into his coverage last year on his way to the top PFF grade among cornerbacks at 91.9. 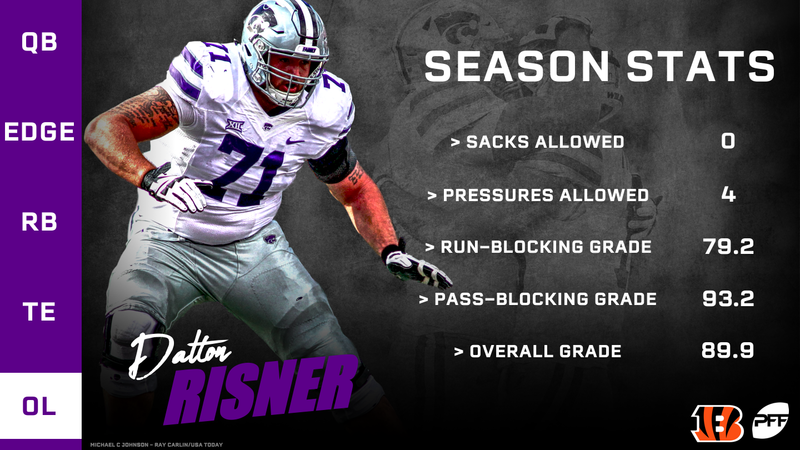 Risner has had an outstanding career at Kansas State, capping with an 89.9 overall grade that ranked second in the nation. He allowed only 28 pressures on 1,490 career pass-blocking attempts. Thompson makes plays from all alignments on the back end and he has the range to play free safety at a high level. His 89.3 coverage grade ranked fifth in the nation, though he did get caught giving up a few big plays over his head as the season progressed. Much like the Broncos, the quarterback value is not a great match here at 13 so the Dolphins look to shore up their defensive front with the 340-pound Lawrence. He sheds blocks in the run game and he can push the pocket as a pass-rusher, posting 99 pressures on 809 rushes during his three-year career. While there are questions about Oliver’s size, he’s difficult to block, particularly in the run game where he posted elite grades of 92,0, 94.6 and 94.0 over the last three years. Oliver must improve his technique as a pass-rusher, but the tools are there, and a career-high 88.2 pass-rush grade in 2018 is a step in the right direction. Washington needs to replenish their receiving corps and Arcega-Whiteside has one of the best combinations of body control and contested-catch skills in the draft. His 93.0 overall grade ranked third in the nation in 2018. Carolina is in desperate need of young playmakers along the defensive line and Burns fits the bill after ranking third in the nation with 67 total pressures and a 90.5 grade as a pass-rusher. The offensive line is still an issue in Minnesota and Little has the five-star pedigree and year-to-year development to get excited about his future. He allowed just 10 pressures on 493 pass-blocking snaps last season. While Brown did most of his damage from the slot in college, he has the size and skills to play outside as well. He’s strong after the catch and he is one of the best all-around receivers in the class. The wide receiver class has plenty of big-bodied receivers, and Harry is one of the best in contested situations while adding impressive after-the-catch skills. His large catch radius will be helpful for QB Lamar Jackson’s development. Houston’s offensive line is still in need of an overhaul and Cajuste is one of the best tackles in the draft class. He allowed only 11 pressures on 414 pass-blocking attempts last year. Oakland adds another pass-rusher up front as Jones ranked fourth among interior defensive linemen with a 90.1 pass-rush grade and he finished second with 53 total pressures. 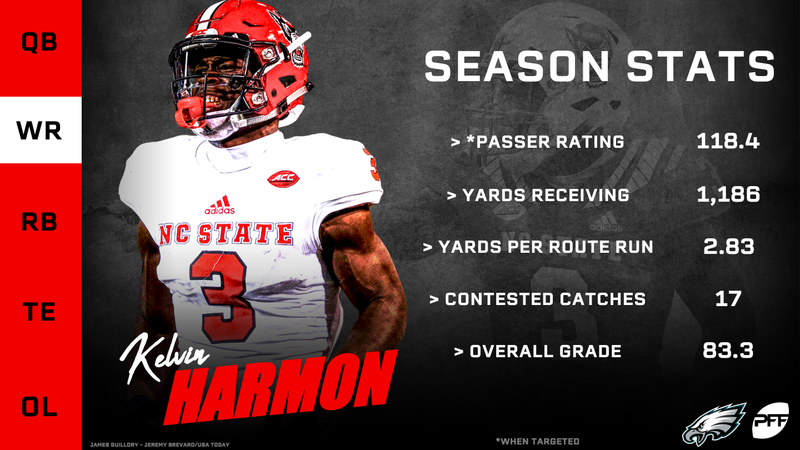 Harmon has the physicality to win at the catch point and over the middle, adding another outside weapon to the Eagles offense. He graded at 83.3 overall last season while winning 17 of his 30 contested catch opportunities. Brown brings a speed element to the Colts’ offense after averaging 19.2 yards per reception in 2017 and 17.6 yards/reception last season. He ranked sixth in the nation with 592 yards on deep passes last year. The defensive overhaul continues with Rapp who has the versatility to play all over the field. He finished with the No. 4 overall grade among safeties last season (90.1) while missing only two tackles on the year. The Chargers have made great strides on the defensive side of the ball in recent years but they still have issues on the defensive interior. Tillery posted the top pass-rushing grade of any interior defensive lineman last season at 92.5 and he has a long 6-foot-7 frame to help out in the run game. The Patriots are in the market for their signal-caller of the future and this is a good spot for Grier who has the downfield touch and accuracy to succeed at the next level. 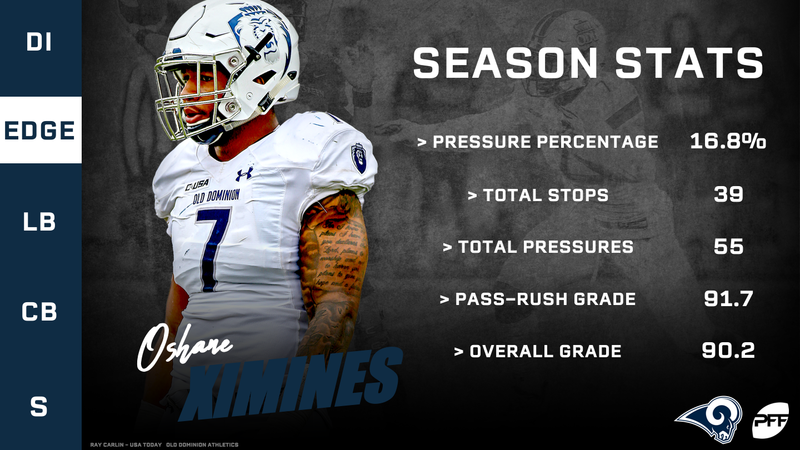 There’s room for extra juice off the edge, and that’s what Ximines provides for the Rams. He posted the No. 3 pass-rush grade among edge defenders at 91.7, notching 55 total pressures on only 348 rush attempts last season. Bush provides middle-of-the-field athleticism as he flies to the ball against the run and in coverage while doubling as one of the best blitzing linebackers in the draft class. He graded at 90.2 overall in 2017 and 85.0 last season. It’s a deep class of pass-catching tight ends and Sternberger is right there near the top. He adds another weapon to the Green Bay passing attack after posting the nation’s top receiving grade at 90.5 to go with 8.3 yards after the catch per reception.